Preheat greased grill to medium-high heat. Grill fruit 3 min. on each side or until lightly browned on both sides. Cut fruit into 2-inch sticks; place in large salad bowl. Add greens, jicama and tomatoes; toss lightly. Drizzle with dressing just before serving. Jicama is a legume which grows underground. Often called a Mexican potato, it is crunchy like a water chestnut and commonly added raw to salads. Shop for jicama in the produce section of most larger grocery stores. To prepare, remove the peel, including the fibrous flesh that is under the skin. Then, cut or slice the jicama before using as directed. Grilling caramelizes the natural sugars in the fruit. Allow 30 to 40 min. for charcoal coals to be ready for outdoor grilling. The coals are ready when covered with a fine, gray ash. If the fire is too hot, carefully use tongs to spread out the coals. Or, for a hotter fire push the coals closer together. 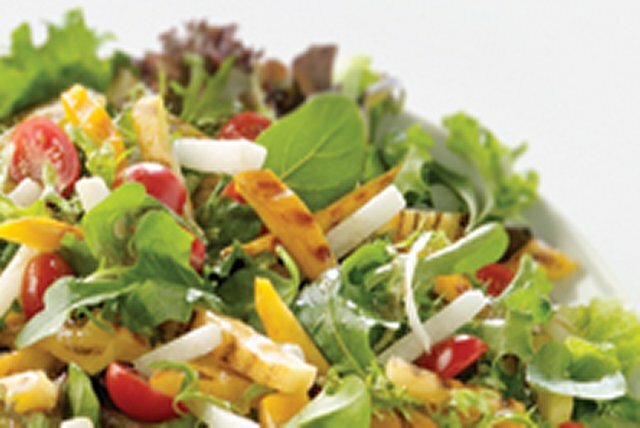 This fruit and veggie packed salad is an excellent source of both vitamin's A and C.